Welcome to 41 on York... A brand new, luxury apartment in Launceston. 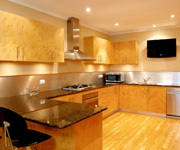 This 4.5 star rated apartment features a stunning huon pine kitchen packed full of features, a spacious living area with an adjoining indoor/outdoor entertaining deck, three double bedrooms, luxurious bathrooms, office with internet, and plenty more. The apartment features 3 double bedrooms, 3 bathrooms, open plan dining and living area, stunning kitchen, office and indoor/outdoor deck area. Luxury features include... Flat Screen TVs in kitchen, living & main bedroom Entertainment system with surround sound Ducted air conditioning/heating throughout Outdoor entertaining area with BBQ & bar fridge Hairdryers in every bathroom Bathrobes & slippers in every bedroom Quality Aveda products (shampoo, conditioner, body lotion, shower gel & soap) Secure undercover parking with 24hr video surveillance Security system Internal access to the Roman baths & day spa The fully equipped deluxe kitchen features... Refrigerator with ice & water dispenser Smeg Gas Cooktop (6 burner) & extra large oven Smeg Dishwasher Panasonic Genius Stainless Steel Microwave Large pantry Gourmet cooking accessories and housewares Tasmanian wine, beer & spirits Main bedroom has king size bed & large walk-in robe, ensuite with spa, double vanity & a unique showering experience. 2nd bedroom has QS bed, ensuite with yet another unique showering system. 3rd bedroom consists of 2 single beds which can be converted to an extra King bed, plus powder room. King Bed large walkin robe; spa & shower spa with complete use of apartment facilities; full laundry, gourmet kitchen, indoor/outdoor dining area, satelite tv under cover secure parking. King Bed large walkin robe; spa & shower spa with full laundry facilities. The apartment features 3 double bedrooms, 3 bathrooms, open plan dining and living area, stunning kitchen, office and indoor/outdoor deck area. Luxury features include 1 x King Bed with ensuite including spa bath & spa shower & large walkin robe; 1 x queen bedroom with ensuite & spa shower; 1 x single bedroom, with powder room. Living area has surroundsound system, satelite tv plus docking station for ipod. Kitchens is equipped with European Appliances, fridge has ice & water dispenser. 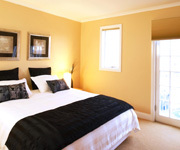 2 Bedroom Luxury Apartment, 1 x King bed with ensuite inlcuding spa bath,1 x Queen bed with ensuite. Fully equipped kitchen with Eurpoean Appliances, large living area, full Laundry Facilities, secure undercover parking. 2 Bedrooms, 1 x King Bed with full ensuite with spa bath & spa shower, 1 Queen bed with ensuite (or a choice of 2 single beds) with fully equippped gourmet kitchen, large living area, full laundry facilities, 2 car parking spaces.